We've never been lucky enough to see it in spate! And so, never ending, but always descending. Print, colour halftone, Lodore and Derwentwater, a summer's morn, Borrowdale, Cumberland, from a watercolour painting by Alfred Heaton Cooper, published by Adam and Charles Black, London, 2nd edn 1908. Opposite p.136 of The English Lakes, painted by Alfred Heaton Cooper, described by William T Palmer. Print, uncoloured, Falls of Lodore, Borrowdale, Cumberland, published by Bemrose and Sons, 23 Old Bailey, London and Derby, by A B Moss, Carlisle, Cumberland, and by T Wilson, Kendal, Westmorland, about 1881. On p.76 of a Handy Guide to the English Lakes and Shap Spa. Photograph, black and white, Lodore Falls, Borrowdale, Cumberland, by Herbert Bell, photographer, Ambleside, Westmorland, 1890s. Photograph, black and white, Lodore Falls, in spate, Borrowdale, Cumberland, by Herbert Bell, Ambleside, Westmorland, 1890s. Photograph, sepia, Lodore Falls, in a dry season, Borrowdale, Cumberland, by Herbert Bell, Ambleside, Westmorland, 1890s. No. : Names and Situations of Falls. : Counties : Feet in Height. Lines cross stream? at 'Low Dore'. Lowdore Inn.- Close to the inn, in the ravine betwixt Gowdar Crag and Shepherd's Crag, is the fall of Lowdore, so whimsically described by Southey. In dry weather, the water almost disappears amongst the jumbled pile of rocks, over which, when full, it rushes with tremendous impetuosity and force. Engraving, Lowdore, the Waterfalls, Borrowdale, drawn by T Binns, engraved by O Jewitt, on p.32 of A Descriptive Guide of the English Lakes, by Jonathan Otley, 8th edition, 1849. LOWDORE CASCADE constitutes one of the most magnificent scenes of its kind among the lakes. It is not a perpendicular fall, but a foaming cataract; the water rushing impetuously from a height of 360 feet, and bounding over and among the large blocks of stone with which the channel is filled; so that when the river is full, it is a striking object at three miles distance. To the left, the perpendicular Gowder Crag, near five hundred feet high, towers proudly pre-eminent; while from the fissures of Shepherd's Crag on the right, the oak, ash, birch, holly, and wild rose, hang in wanton luxuriance. From the foot of the fall, where it is usually seen, more than half its height lies beyond the limits of the view, and in dry seasons there is a deficiency of water; yet its splendid accompaniments of wood and rock render it at all times an object deserving the notice of tourists. Winding round Shepherd's Crag towards the top of the fall, and looking between two finely wooded side screens, through the chasm in which the water is precipitated, a part of Derwent lake with its islands, beyond it the vale of Keswick, ornamented with white buildings, and the whole surmounted by the lofty Skiddaw - forms a picture in its kind scarcely to be equalled. Print, coloured aquatint, Lowdore Fall, Borrowdale, Cumberland, drawn by Theodore H A Fielding, published by R Ackermann, 101 Strand, London, 1821. Tipped in opposite p.169 in A Picturesque Tour of the English Lakes. Print, coloured aquatint, Skiddaw, from the Head of Lowdore Fall, Borrowdale, Cumberland, drawn by John Walton, published by R Ackermann, 101 Strand, London, 1821. Tipped in opposite p.248 in A Picturesque Tour of the English Lakes. in sheets of foam; now it leaves the more perpendicular rock, and forms a chrystal arch; and now it runs almost invisible among pointed, broken projections. During a flood, this, like every other cascade, appears with redoubled magnificence. The stream now almost entirely leaves the rock, and pours down, in one-continued sheet, 200 feet high. Should it accidentally catch the point of some projecting cliff, the water is dashed on all sides with inconceivable violence; the noise and roaring of this impetuous torrent is beyond description, and may be heard at several miles distance. Guide book, Observations, Relative Chiefly to Picturesque Beauty, Made in the Year 1772, on Several Parts of England, Particularly the Mountains, and Lakes of Cumberland Westmoreland, by Rev William Gilpin, 1772-74; published 1786-1808. By this time we had approached the head of the lake; and could now distinguish the full sound of the fall of Lodoar; which had before reached our ears, as the wind suffered, indistinctly in broken notes. This water-fall is a noble object, both in itself, and as an ornament of the lake. It appears more as an object connected with the lake, as we approach by water. By land, we see it over a promontory of low ground, which, in some degree, hides it's grandeur. At the distance of a mile, it begins to appear with dignity. But of whatever advantage the fall of Lodoar may be as a piece of distant scenery, it's effect is very noble, when examined on the spot. As a single object, it wants no accompaniments of offskip; which would rather injure, than assist it. They would disturb it's simplicity, and repose. The greatness of it's parts affords scenery enough. Some instruments please in concert: others we wish to hear alone. water in opposition can hardly produce a more animated strife. The ground at the bottom is also very much broken, and over-grown with trees, and thickets;amongst which the water is swallowed up into an abyss; and at length finds it's way, through deep channels, into the lake. We dismounted, and got as near as we could: but were not able to approach so near, as to look into the woody chasm, which receives the fall. The great Water fall / R. Stephenson's Esq. I do not know that the height of this cataract has been ascertained, but when viewing it, the reader may like to have it recalled to his mind, that Carver says, the fall of Niagara does not exceed 140 feet. ... 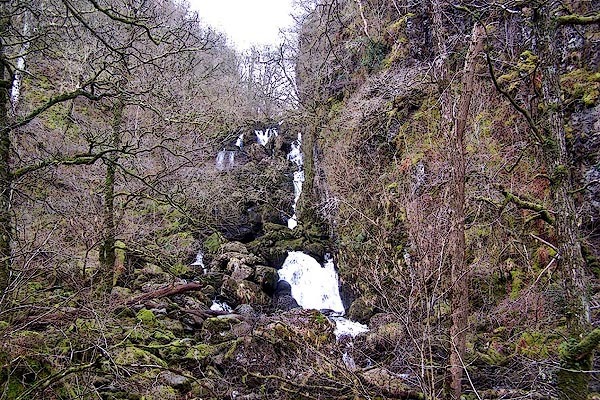 These [Stockghyll Force and High Fall, Rydal], when I saw them, were in full torrent; whereas Lowdore water-fall, which I visited in the evening of the very same day, was almost without a stream. Hence I conclude that this distinguished feature in the vale of Keswick, is like most of the northern rivers, only in high beauty during bad weather. This alludes to the great water-fall at Lowdore. Print, halftone photograph, Lodore, Looking up the Cataract, Borrowdale, Cumberland, published by C Arthur Pearson, Henrietta Street, London, 1900s. On p.166 of Pearson's Gossipy Guide to the English Lakes and Neighbouring Districts. Print, engraving, Lodore Cascade, Borrowdale, Cumberland, drawn by Gilks, published by John Johnstone, Paternoster Row, London, et al, 1847. On p.168 of Sylvan's Pictorial Guide to the English Lakes. [ ] Gilks / LODORE CASCADE. Guide to Keswick and its Vicinity, in the Penny Guide Books series, published by Abel Heywood and Son, 56-58 Oldham Street, Manchester, and by Simpkin, Marshall, Hamilton, Kent and Co, Ave Maria Lane, Paternoster Row, London, 1906. Print, halftone, Lodore, the falls, Borrowdale, Cumberland, from a photograph by H Bell, Ambleside, published by Abel Heywood and Son, 56-58 Oldham Street, Manchester, and by Simpkin, Marshall, Hamilton, Kent and Co, Ave Maria Lane, Paternoster Row, London, 1906. In a Guide to Keswick and its Vicinity in the Penny Guide Books series. Photo by / LODORE. / H. Bell, Ambleside. English Lake Scenery, by W J Loftie, with chromograph illustrations by T L Rowbotham, published by Marcus Ward and Co, 67-68 Chandos Street, Covent Garden, London, and Belfast, 1875. Print, engraving, Cataract of Lodore, Borrowdale, Cumberland, drawn by EMW, engraved by J Cooper, published by Marcus Ward and Co, 67-68 Chandos Street, Covent Garden, London, and Belfast, 1875. On p.15 of English Lake Scenery, by W J Loftie. EMW / J. COOPER Sc. / CATARACT OF LODORE. Set of prints, engravings, Views of the English Lakes or Views in the English Lake District, published by John Garnett, Windermere, Westmorland, 1850s-60s? Print, uncoloured engraving, Waterfall at Lowdore, Cumberland, drawn and engraved by William Banks and Son, Edinburgh, published by John Garnett, Windermere, Westmorland, 1850s-60s? Included in Views of the English Lakes. Drawn & Engd. by W. Banks & Son, Edinr. / WATERFALL AT LOWDORE. Set of prints, uncoloured engravings bound in a booklet, Harwood's Views of the Lakes, drawn by John and Frederick Harwood, 26 Fenchurch Street, London, about 1842. Print, uncoloured engraving, Lodore, Cumberland, engraved and published by John and Frederick Harwood, 26 Fenchurch Street, London, 1842. London, J & F. Harwood, 26, Fenchurch Street. / Sepr. 27, 1842. / Lodore, Cumberland. Print, uncoloured engraving, Lowdore Cataract, Cumberland, drawn by Thomas Allom, engraved by J C Bentley, published by Fisher, Son and Co, London, 1833.
vol.1 pl.59 in the set of prints, Westmorland, Cumberland, Durham and Northumberland Illustrated. The falls in spate. T. Allom. / J. C. Bentley. / LOWDORE CATARACT, CUMBERLAND. / FISHER, SON & CO. LONDON, 1833. Print, uncoloured engraving, Derwent Water, and Lowdore, Cumberland, drawn by H Gastineau, engraved by W le Petit, published by Fisher, Son and Co, London, 1832-35.
vol.1 pl.35 in the set of prints, Westmorland, Cumberland, Durham and Northumberland Illustrated. H. Gastineau. / W Le Petit. / DERWENT WATER, & LOWDORE, CUMBERLAND. Set of prints, 43 engravings, The Lakes of Lancashire, Westmorland, and Cumberland, drawings by Jospeph Farington, with text by Thomas Hartwell Horne, published by T Cadell, and W Davies, Strand, and by J M'Creery, Black Horse Court, Fleet Street, London, 1816. Print, uncoloured engraving, View on the Road from Keswick to Borrowdale, drawn by Joseph Farington, engraved by F R Hay, published by T Cadell and W Davies, Strand, London, 1815. Barrow House? and Lodore Falls, etc etc. Plate 20 in The Lakes of Lancashire, Westmorland, and Cumberland. Drawn by J. Farington. / Engraved by F. R. Hay. / View on the Road from Keswick to Borrowdale. / London, Published Septr. 15, 1815, by T. Cadell & W. Davies, Strand. Print, uncoloured engraving, East Side of Derwentwater looking towards Lowdore Waterfall, Cumberland, drawn by Joseph Farington, engraved by F R Hay, published by T Cadell and W Davies, Strand, London, 1815. Drawn by J. Farington. / Engraved by F. R. Hay. / East side of Derwentwater looking towards Lowdore Waterfall. / London, Published Septr. 15, 1815, by T. Cadell & W. Davies, Strand. Print, engraving, Lowdore Waterfall, painted by Joseph Farington, engraved by W Byrne and T Medland, published by W Byrne, 79 Titchfield Street, London, 1785. Plate 4 from Views of the Lakes, &c, in Cumberland and Westmorland, published 1789. IS generally esteemed one of the most striking Objects of the Kind in this country; its Accompanyments are uncommonly picturesque and grand. These indeed compose of themselves a Scene which cannot but interest the Spectator, even when the Fall of the Water, which depends upon the State of the Weather, is inconsiderable. The stupendous Craggs between which the Torrent precipitates itself broken into the boldest Forms, are shagged with Trees hanging every where in the most fantastic Shapes, from the Fissures of the Rock. The Height of the Fall itself Mr. Gray conjectures to be about two Hundred Feet. At some Distance above the Fall the Stream proceeds from a Lake about a Mile in Circumference. To this sequestered Spot Travellers are seldom conducted, though they might perhaps think themselves amply recompensed for their Trouble, by a Sight of the various romantic Circumstances which occur in this Excursion: The Lake and Village near it are called Wawtenleth. The Point from whence this View is taken is a little to the Right of the Road leading from Keswick into Borrowdale, near the Side of the Derwentwater, where it forms a small Bay. As these Engravings are offered to the Public as faithful Representations of Nature, it may not be improper to observe that the Permanency of the Resemblance is liable to be affected by the frequent Fall of Timber and Coppice Wood which takes place on the Borders of these Lakes. An Allowance will of course be made for any Variation of this Kind which may appear between the Plate and the Original. Guide book, Adams's Pocket Descriptive Guide to the Lake District, by Sir Edward Litt Laman Blanchard, illustrated by F G Delamotte, published by W J Adams, 59 Fleet Street, London, 1852. Print, engraving, Keswick Lake and Lowdore Fall, by F G Delamotte, published by W J Adams, 59 Fleet Street, London, 1852. Tipped in opp.p.59 in Adams's Pocket Descriptive Guide to the Lake District. KESWICK LAKE AND LOWDORE FALL. Print, uncoloured engraving, Lowdore Waterfall, Borrowdale, Cumberland, by ?B Foster, engraved by E Evans, 1850s-60s? Print, chromolithograph, Lodore Falls, Derwentwater, Cumberland, published by T Nelson and Sons, London, 1900s? Print, engraving, Waterfall at Keswick, presumably Lodore falls, Borrowdale, Cumbria, published by F Blyth, 87 Cornhill, London, 1775.